Grill the chili peppers, flipping them occasionally so they don’t burn. Later, place them in a bag or in a closed container. Seal and allow the vapor to soften the skins for easier peeling. Use a small knife to slice open, lengthwise, and deseed and devein. Set peppers aside. In a hot frying pan, heat the oil and fry the onion until golden. Add the mushrooms, stirring occasionally. Add the chopped jalapeño peppers, and season with salt and pepper, to taste. Set aside. 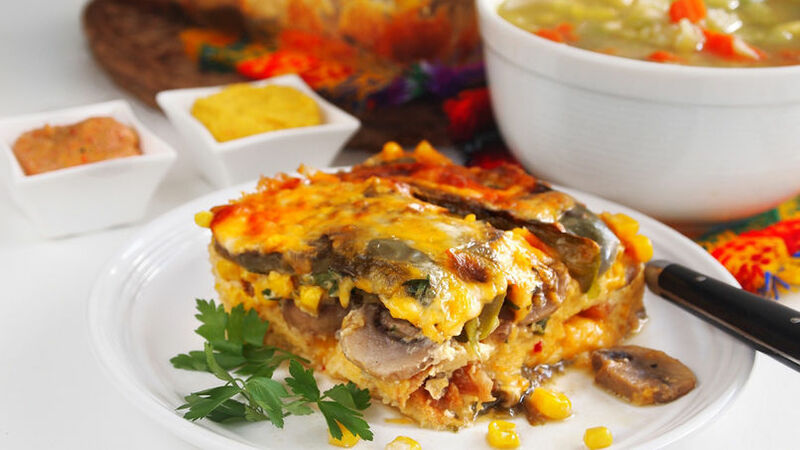 In a rectangular or square glass baking dish, create a layer with half of the poblano peppers. Cover with a layer of onion and mushrooms, half the shredded cheese, corn, cilantro and diced bread. Layer with the remaining poblano peppers. In a container, beat together the eggs and milk, and season with salt and pepper. Pour over the top of the peppers and sprinkle with remaining cheese. Bake for 50 minutes. Let rest for approximately 15 minutes before serving. Serve and enjoy! Let cool before cutting for perfect slices. Swap out the Monterey Jack cheese for cheddar cheese to play with the flavor. Chiles rellenos are one of Mexico’s more popular dishes, especially in Puebla where the poblano pepper is from. Traditional Mexican-stuffed pepper recipes were filled with meat picadillo, but this recipe has since evolved and many peppers are now stuffed with different regional cheeses, dipped in egg wash, and fried. My grandmother would often use the bell peppers she had on hand in El Salvador in place of the poblano pepper. As you’ll see, this recipe can be used as the base for a number of other flavorful dishes that are easy-to-prepare. We can always be creative in the kitchen when we use what we have on hand!